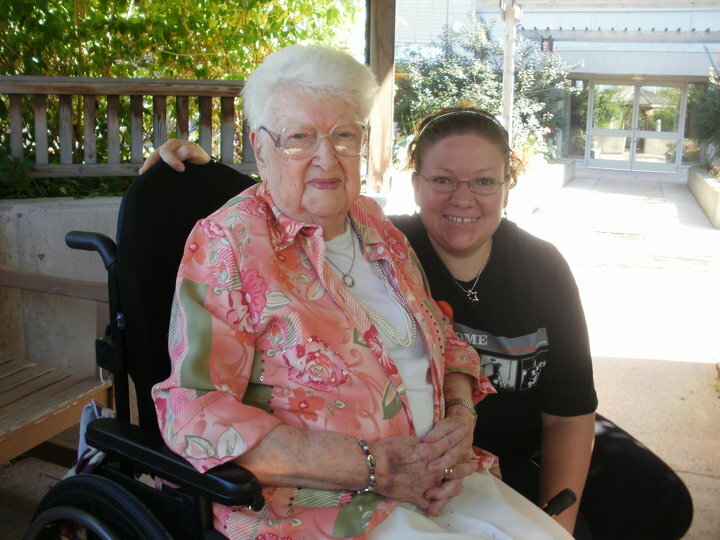 My beloved Grama passed away Thursday morning, 4 months shy of her 100th birthday. She was one of the two most amazing women I've ever had the good fortune of knowing (the other being my mum). She was kind, loving, thoughtful, funny, and one of those people who you loved the instant you met her, and never forgot. She touched so many people's lives and made so many people better. She was so much more than just a grandmother to me, she was one of my best friends - one of the only people in life that I could always count on, always turn to, who supported and encouraged me no matter what. She was a beautiful, shining soul and the world feels a little darker without her in it. Yesterday after she died, we had to go clear out her room because of some dumbass rule that gives the family 24 hours to pack up a resident's room. My cousin Lori picked me up (it's been years since I've seen her - we don't live all that far apart, it's just sort of one of those things) and we headed over to Grama's and were soon joined by my mum, Stephanie (Lori's daughter, my second cousin), and my Aunt Janet. Grama was a packrat and hoarder (not of TV proportions, but almost 100 years worth of stuff, minus the stuff that we've collected and stored for her during various moves), and had an unbelievable amount of stuff crammed into every nook and corner of her small room. I was dreading it, and even though it was hard and more than a few tears were shed, having my cousins around made things so much better. Like I said, I almost never get to see them, so it was a chance for us to catch up and bond over our love of our amazing grandmother. We talked, shared stories, laughed, and one of the worst days of my life was made a bit less awful. Here's the thing though...I know that I'm truly blessed to have had her in my life for so long, and it's amazing and wonderful that she lived so long. But there's this little part of me that's angry - so angry I could scream - because there's so much more I wanted to tell her and ask her, and I so badly wanted her to read my book. Part of my reason for deciding to self-publish was because she was so old and I desperately wanted her to see me as a published author (which she knew was my lifelong dream) and hold my book in her hands. She was my biggest fan, my biggest supporter, and always took such a keen interest in my writing. She always wanted to know what I was working on, read my articles and stories, and she loved every little tidbit I'd give her about my novel, even when I was in the stage of being secretive about it. So I'm angry and sad and bitter and a million other emotions because now it's too late. She'll never get to read my dedication to her and my mum, or the acknowledgements, where I thank her profusely for everything she's done for me. It's funny, the other night in the hospital, I told her I was almost done my cover art and her eyes lit up and she moved closer to me and asked me to describe it in detail. Something about the way she asked me, and the eager, hungry look in her eyes made me think that she knew she'd never get to see it. I don't really know where to go from here. My life will never be the same. I know she'd want me to be strong and move on, so I'm going to do it for her, but god, it's going to be hard. I'm going to keep her in mind as I finish the final revisions of my novel and I'm going to follow my dreams and not let anything stop me, because she was so proud of me, and I can't let her down now. One of my Grama's many hobbies was knitting. Every year, she knit mittens for the firefighter's mitten tree, to be given to children in the community whose families couldn't afford warm winter clothes. She made the most beautiful mittens and took great care, pouring love into every single pair. I wrote about it here: Helping Those Less Fortunate - Knitting and Crocheting For a Good Cause. I need to update it with news of her death and the fact that she managed to get 38 pairs done this year before she died. Amazing. For those of you who know me or have visited my blog before, you'll know I'm a U2 fanatic. At one point this morning, the song 'Kite' popped into my head and I felt compelled to come to the computer and listen to it. The lyrics were so fitting; I could almost hear Grama's voice in my head saying the words to me. I started to cry and the phone rang and it was my mum telling me Grama was gone. U2 has been the soundtrack of my life for a long time now, and I know they'll help me get through this, too. I am so sorry for your loss. My thoughts are with you and your family. Take care! My love and thoughts are with you all. My own grandmother was the most exceptional woman, and there is not a day goes by when I don't think of her. Yesterday would have been her birthday and so your loss really resonated with me because she was in my thoughts all day. No one really passes on if there are people to remember. I am so sorry, girl. I lost my Grandma Jean a couple years back, and she was always my rock, in a lot of ways, some that I didn't even realize until she was gone. I'm tearing up reading your post, and thinking about my Grandma... I sincerely feel for you and for your family. Nothing will make this any easier, except time, unfortunately. I wish you lots of healing vibes, and do continue to work on your book like you have been...your dreams mean more than ever now! If you want to talk, shoot me an e-mail at courageousgrace@gmail.com. Take care of yourself, Marie!